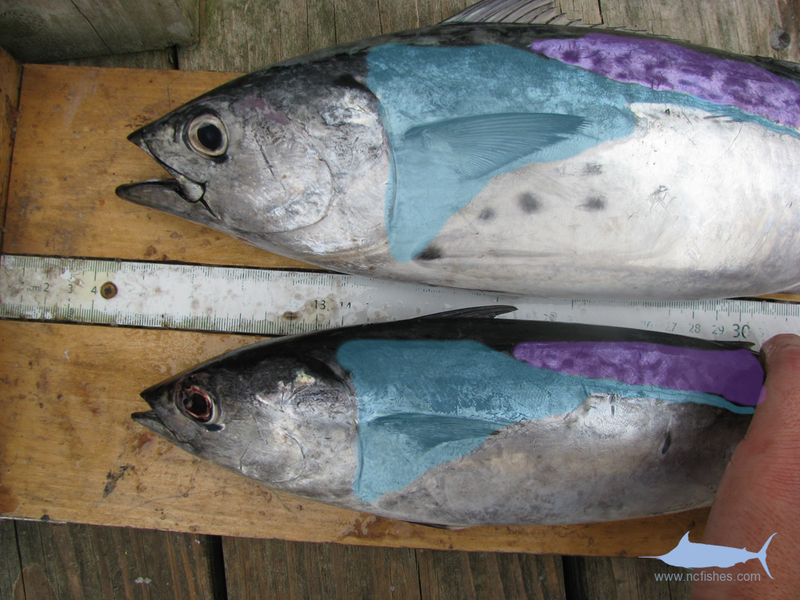 This article aims to guide you in properly identifying the Frigate Mackerel, Auxis thazard thazard, from the almost identical Bullet Mackerel, Auxis rochei rochei. These two scombrids are often confused with each other, and with the Little Tunny, Euthynnus alletteratus, by everyone from anglers to fisheries professionals. After reading this however, you should be able to correctly identify the subtleties that distinguish these species from each other. Before we dive into this, we need to take a second to cover some vocabulary. This is a system of sensing organs along the sides of fishes that is used to detect vibrations in surrounding water. Not all fish have a lateral line, and some have partial, but those that do, have a visible line from head to tail along the midline of the body. A band of scales that forms behind the head, and continues along the lateral line toward the caudal fin. A fleshy tab located between the pelvic fins of some scombrid fishes. The little tunny can be easily identified by comparing the length of the base of the first dorsal fin. 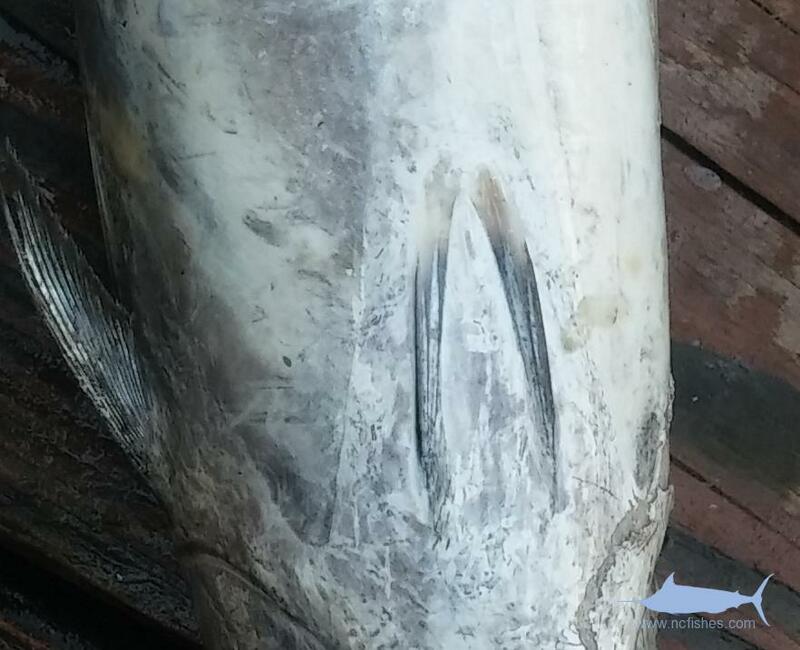 Compared to the frigate and the bullet mackerel, the little tunny has a much longer first dorsal fin base as evident in the following photograph. The space between the first and second dorsal fin in the little tunny is less than the diameter of the eye, where the same space in Auxis is many times the diameter of the eye. The little tunny also usually has a series of spots under the pectoral fin, where both the frigate and bullet mackerel do not. Also, the interpelvic process of Auxis is single, long, and narrow, where the little tunny’s process is small and with two lobes. Once you have narrowed your fish down to the genus Auxis, the identification gets easier. 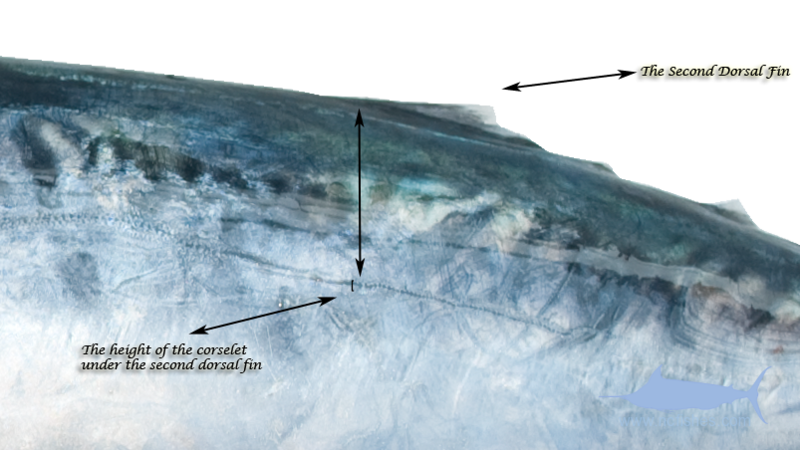 Our main point of focus will be the scales of the corselet, along the lateral line, and specifically the number of scales that comprise the height of the lateral line under the second dorsal fin. 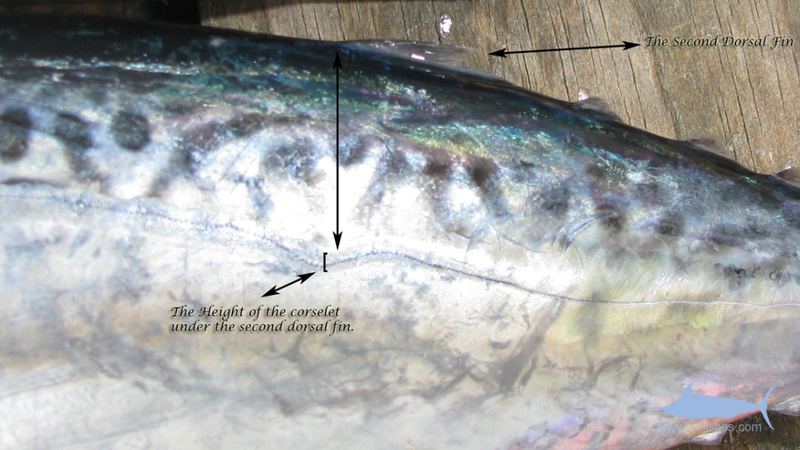 The height of the scaled section of the lateral line, directly under the second dorsal fin is no more than five scales in the frigate mackerel, where in the bullet mackerel, the height is greater than six scales. This may seem like a trivial and hard to distinguish difference, however in practice, this is a quick way to identify these fishes. Height of the corselet in a Bullet Mackerel is greater than 6 scales high under the second dorsal fin. Height of the corselet in a Frigate Mackerel is Less than 5 scales high under the second dorsal fin. These pictures may not do the difference in height any justice, but rest assured that in the field, this difference is obvious. Secondly, there is a difference in the position of the unscaled area above the corselet, in reference to the pectoral fin. 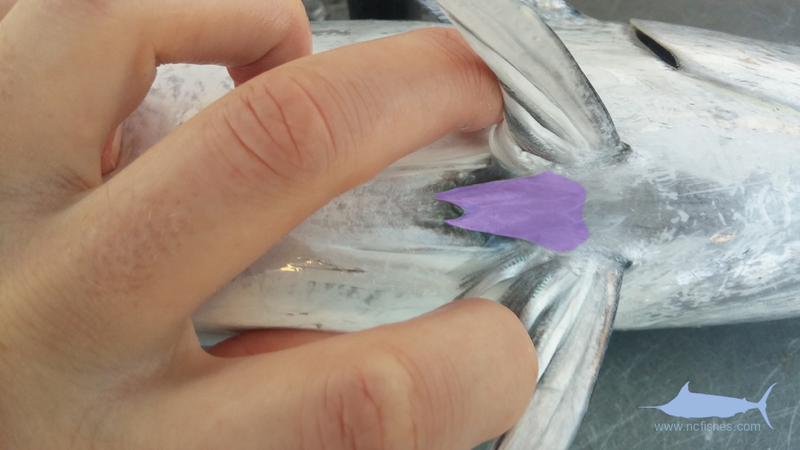 Drawing a vertical line from the anterior margin of the unscaled area above the corselet and down will not intersect with the pectoral fin in the bullet mackerel, where in the frigate mackerel, it will. Again, this may seem difficult to imagine, but in practice is easy to use. Notice the overlap of the pectoral fin on the anterior margin of the unscaled area above the corselet. Notice the gap between pectoral fin and anterior margin of the unscaled area above the corselet. So there you have it, an easy way to identify these 3 commonly caught species with just a glance. Remember that no two fish are ever identical, and variation can sometimes lead to individuals that don’t follow any of these rules. In the last 6 years I have only encountered one fish from this complex that I could not for the life of me identify, so these criteria are pretty solid. One mnemonic device you can use is to remember that “frigates are very narrow ships”. As silly as this is, when used in reference to the height of the corselet, it will help you remember. 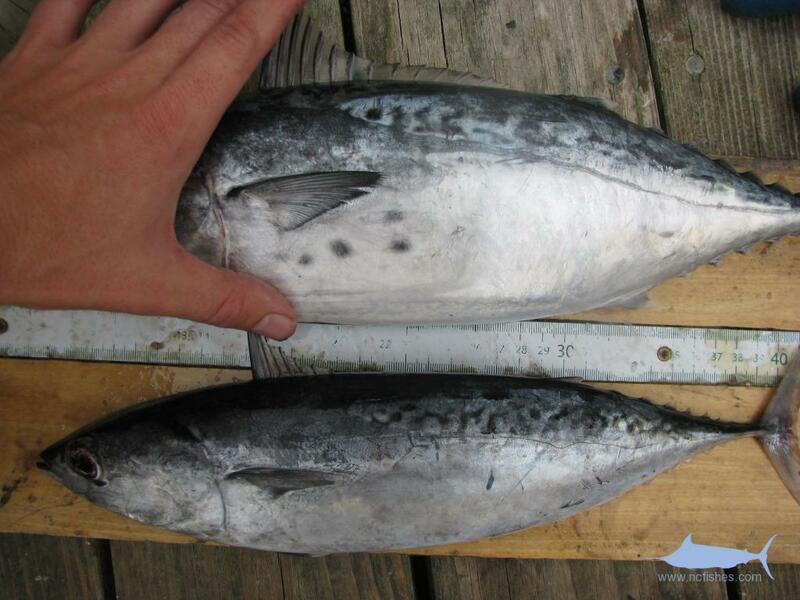 Frigate Mackerel vs Bullet Mackerel by Fishes of North Carolina is licensed under a Creative Commons Attribution-NonCommercial-ShareAlike 4.0 International License.